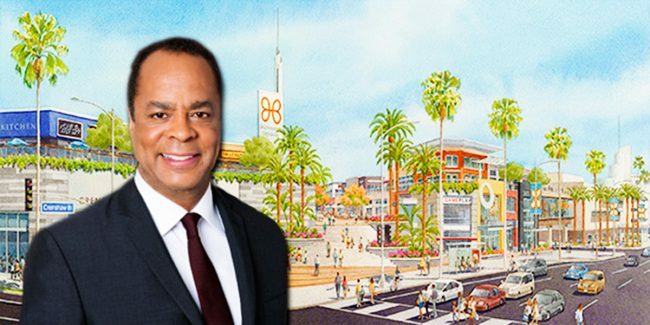 UPDATED, Friday, June 29, 2018: Capri Capital Partners has won approval to redevelop the Baldwin Hills Crenshaw Plaza into a mixed-use complex featuring condos, hotel rooms, offices and retail. The Los Angeles City Council signed off on the project Wednesday, nearly a year after the Planning Commission voted in its favor. The Los Angeles Times first reported the story. 300,000 square feet of retail and restaurant space, and a 10-story office building. The indoor mall and movie theater on the site will remain intact. South L.A. residents strenuously resisted the $700 million redevelopment project, fearing it would boost gentrification in the area. Supporters, meanwhile, argued the redevelopment could draw new interest in the area, allowing it to compete with online retailers and other malls. To gain approval, Chicago-based Capri agreed to set aside 10 percent of the apartments and for-sale units to low-income residents. Specifically, 10 percent of the condos will be available for residents making 150 percent of the area’s median income. That translates to up to $130,000 for a family of four. The city also mandated that local residents account for at least 30 percent of the workforce hired to build and run the project. Capri will also have to pay $2 million to Los Angeles Trade Technical College for educational programs, plus another $1.5 million to the council district for local improvements. The Baldwin Hills shopping mall, built in the 1940s, is adjacent to the future Metro Crenshaw Line station. Capri purchased the property on behalf of investors in 2006, and later completed a multimillion-dollar upgrade to the mall.